Advisory boards for nonprofit organizations can make the difference in providing additional expert knowledge and finding balanced unbiased answers for important projects. Since many nonprofit organizations are also small businesses and sometimes family-owned, an advisory board can also network and find ways to maximize project opportunities outside of the expertise areas and connections of the Board of Directors. Learn how advisory boards work and the benefits of forming one. Advisory boards, aka advisory groups or advisory committees, are comprised of people who bring expert knowledge or skills that can enhance a company's official board of directors. Advisory boards generally provide recommendations and important information but do not have any governing authority over the company. A company's formal board of directors usually appoints members to an advisory board. What type of people become advisory board members? It depends upon the reason for the advisory board's existence. 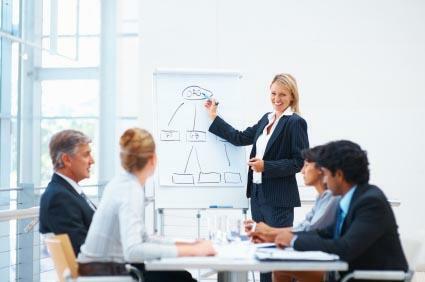 Companies may appoint advisory board members to bring additional needed expert insight into a field or special project. Sometimes companies also honor retired company officials or major financial contributors with advisory board seats. Companies generally form one of two types of advisory groups - standing or ad hoc. A standing advisory board is in existence on an on-going basis. An ad hoc advisory board is temporary and is usually formed for a specific project. Nonprofit organizations benefit from advisory boards because members can help find resources to fulfill projects despite any funding limitations. A nonprofit organization can sometimes encounter road blocks for project completion because of a small staff, limited budget or government red tape. Advisory boards, who often represent both the nonprofit and for-profit industries, can bridge the gap and bring expert advice, affordable or free resources and connections for fundraising efforts. When credibility in an unrelated field is necessary for a project, it is handy for a nonprofit organization to have an advisory board member from the field in question. Some critics of advisory boards warn against the formation of advisory groups believing that they can possibly lead to conflicts between formal board of directors and advisory committee members and block progress. Conflicts may occur if advisory members have unrealistic expectations or mistakenly believe they have a governing authority over the organization equal to the board of directors. These critics advise any nonprofit organization considering forming an advisory board to clearly clarify member duties and expectations to prevent confusion and conflict. In fact, some critics claim that the word board should not be used to prevent confusion over status. The critics argue that the term board should only be used for the company's official board of directors to clarify status. Instead, they recommend only using the terms advisory group or advisory committee. Does the board of directors or company officials need advise in a field outside of their expertise? The board of directors can appoint experts in the field to an advisory board for input. Is there a company issue that needs an unbiased opinion from a nongoverning body? An advisory board can analyze and provide answers from an unbiased stance because they have no governing authority over the company. Can the board of directors handle a special project with current resources? If not, an advisory board can provide input, skills or resources for the special project. Does the company need to demonstrate credibility in a particular field quickly? Appointing experts from the field to an advisory board is a fast way to gain credibility in a new field. Does the company have time to foster a meaningful and beneficial relationship between the advisory group and the board of directors? Advisory boards are only effective if they members have clearly defined roles, effective meetings and a chance to complement the board of directors. Some companies have missed opportunities to reap the benefits of effective advisory boards by using such groups as only figure heads. Clearly describe the role of the advisory board in writing. Create a set of by-laws for the advisory board that states the duties and limited authority of the advisory board. Appoint a chairman who can run the advisory board, ensure effective meetings and act as an intermediary between the formal board of directors and the advisors. Include a detailed description of the advisory board duties in the formal board of directors' by-laws. This makes sure that both the advisory board and board of directors members are aware of the true role of the advisors. Make sure that each advisory board member knows what type of assistance the company requires from him. The advisory board should meet regularly and have a detailed agenda. Only create ad hoc advisory boards for special projects or events. A standing committee is more appropriate when the advisors are needed long-term. Be sure to have each advisory board member sign a nondisclosure and noncompete agreement. Advisory boards for nonprofit organizations can add many benefits when formed correctly. Companies can't go wrong if they find the right members and form the advisory group effectively.